There was a time when people knew about few types of salad such as vegetable salad and Russian salad but these days you will find millions of recipes of salad that are healthy and tasty at the same time. Summer season is the season of variety of fruits so why not make use of them in salad recipes. 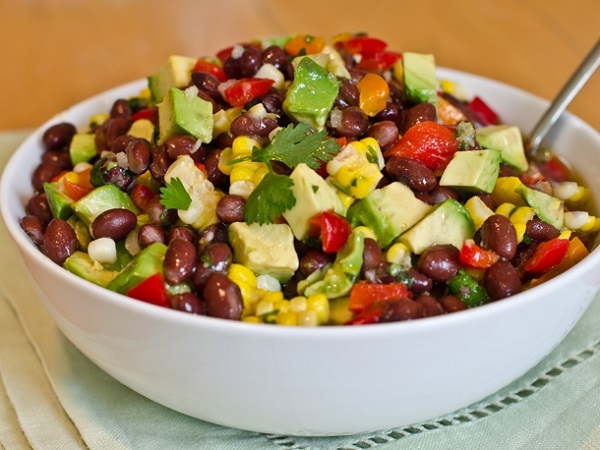 Today I would love to share with you 2 easy recipes of Avocado Corn Black Bean Salad. Many of us are looking for perfect recipe of salad containing avocado, corn and black bean. Here I would like to share with you the recipe of this amazing summer salad in which you will fell in love with. First of all combine all these salad ingredients in a bowl. The ingredients include fresh corn, black beans, avocadoes, onions, grape tomatoes and cilantro. Then you have to mix these vegetables. In the next step you need to add all the dressing ingredients such as olive oil, lemon juice (the purpose of lemon juice is to prevent avocados from turning brown), salt and black pepper. Toss and combine all these ingredients so that everything is properly mixed. 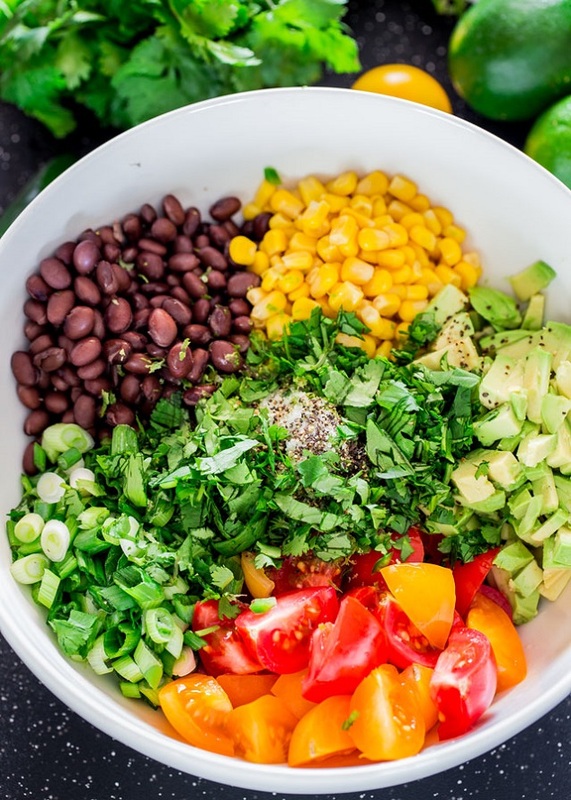 You can serve this avocado corn black bean salad immediately as it is very simple yummy and short recipe that don’t require too much time, this amazing recipe with perfect flavor is prepared in 30 minutes and you can also add your more spices according to your taste. 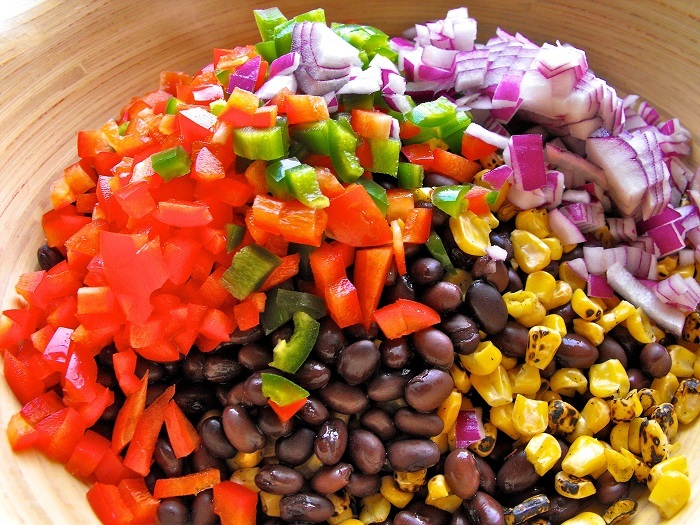 First of all you have to mix ingredients like cumin, black pepper, salt, cilantro, Cayenne Pepper and other spices then take a large bowl and mix corn, beans, onions, red bell pepper and green onions together. Then you need to add all spices and mix it up together you can refrigerate this overnight and then toss before serving. You can also add avocado and grilled chicken for variation. Moreover, corn grains can be grilled as well. Those people who are struggling with their weight should start eating salad because it is a great way to lose some weight. Do you know that salad in the diet will make you feel less hungry? Yes off course because salad is high in fiber content. The salads not only improve functioning of digestive system but also help in reducing your weight. These recipes are low in calories so they give you enormous health benefits. As there are a lot of vegetables added in salad so it means they are rich source of anti-oxidants. Those people who really want to make some healthy changes in their life style should start eating salad recipes salad are great option to lose weight and to stay healthy especially in summer season. These days health expert also recommend eating salad with regular meals because raw vegetables in salad are rich source of essential vitamins and minerals, adding meat or lentils will make your salad a rich source of protein and you can also add dried nuts in your salad. ← Can Beets Be Eaten Raw?